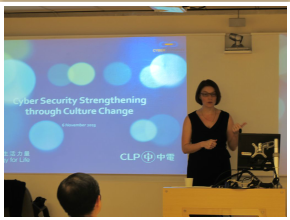 It was our pleasure to have Ms Claire Fulford, Group IT Manager – Cyber Security at CLP, speak with us on the Cyber Security strengthening through Cultural Change on 6 November 2013 (7pm) in the Hong Kong Polytechnic University. Claire has responsibility for governing the direction of policy, standards, and technologies for the protection of CLP’s critical infrastructure and information assets. 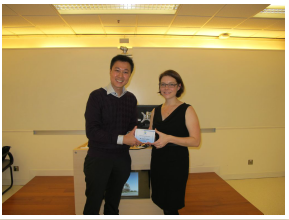 Claire’s focus reaches beyond technology to the people and processes supporting CLP’s operations in China, India, Hong Kong and Australia. In this speaker session, Claire gave a sharing on working with staff across the business and the region on initiatives focusing on a long term strategy for cyber security cultural change at CLP. She explained the journey of engaging leaders, understanding resistance points and the objectives of the program. She also presented key success factors, business benefits and finally the challenges faced in taking staff from awareness to commitment to a more cyber secure employee community. The seminar was well received with over 30 IT architects and managers. We had a fruitful interactive Q&A session where Claire discussed with the audience on how to tackle the resistence from business stakeholders on adopting cyber security. She also provided her views on different aspects of cyber security awareness program and the importance of face-to-face conversations and training.